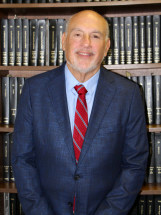 Michael D. Chechanover is of Counsel to Klee Woolf Goldman & Filpi, LLP. Mr. Chechanover has been representing injured workers before the New York State Workers' Compensation Board since 1989. He has a Bachelor of Arts from SUNY Oneonta and received his Law Degree from Fordham University School of Law. Mr. Chechanover started his legal career as a Law Assistant in the NYC Civil Court. Michael serves on the Board of Directors of the Injured Workers' Bar Association of New York and is a member of the Workers' Compensation Committees of the New York State Bar Association, Queens County Bar Association, the Nassau County Bar Association and was the Secretary of the Society Of New York Workers' Compensation Bar Association. Highly regarded by Judges and fellow attorneys, Mr. Chechanover has lectured to attorneys and doctors on Workers Compensation issues and is fluent in Spanish.